Your Health. Your Life. Our Passion. Periodontics is a branch of dentistry that involves the prevention, diagnosis and treatment of diseases of the gums. Periodontal disease (gum disease) is an infection of the structures around the teeth, which mainly includes the gums but also affects the ligaments and bones. Gum disease can have a negative impact on your life, but treatments are available. Gum disease can exacerbate heart conditions. The bacteria found in gum disease travels through the bloodstream and can end up anywhere in your body, including your heart. Regular oral health examinations can detect gum disease before it significantly impacts your overall health. Research has found gum disease can worsen the effects of Chronic Obstructive Pulmonary Disease (COPD) and other respiratory problems. Bacteria from the mouth and throat can be inhaled into the lungs. These respiratory infections can be life threatening. Brushing and flossing your teeth every day are important steps to prevent infections from happening. If left untreated, gum disease can eventually lead to tooth loss. The body’s natural response to infections causes bone and tissue to break down over time. Deep cleanings and surgical procedures can help save your smile. Periodontal disease is characterized by bleeding, painful, and swollen gums. Other symptoms include receding gum lines and sensitive teeth. If you suspect you might have periodontal disease, we recommend you schedule a visit with our team. Routine oral health examinations, twice-daily brushing, and regular flossing are your best defenses against periodontal disease. To schedule a consultation with our team, please contact our office. Researchers say they’ve found more evidence linking bacteria found in a common type of gum disease to dementia. A new study, published in the journal Science Advances, found a key pathogen associated with chronic periodontal disease in the brains of people with Alzheimer’s disease. The study authors say these results, plus additional testing in mice, provide “solid evidence” of a link between the two diseases and may offer a potential new way to treat Alzheimer’s. The devastating illness affects 47 million people worldwide, and there is no cure. However, Alzheimer’s experts not involved in the research caution that it is too early to tell how strong this association is, or whether it could lead to effective treatments. Scientists from Cortexyme, Inc., a privately held, clinical-stage pharmaceutical company, analyzed the brain tissues of patients with Alzheimer’s disease and found evidence of Porphyromonas gingivalis, the bacteria associated with gum disease. Further tests in mice found that this bacteria could travel from the mouth to the brain and increased production of amyloid beta, a protein strongly associated with Alzheimer’s. In addition to the Porphyromonas gingivalis, the researchers found toxic enzymes produced by the bacteria called gingipains in the neurons of patients with Alzheimer’s. Higher levels gingipain were associated with tau and ubiquitin, two other proteins involved in the development of Alzheimer’s. The team also tested drugs in mice aimed at clearing the harmful bacteria and blocking its toxic enzymes. In these lab experiments, scientists were able to reduce the number of Porphyromonas gingivalis bacteria in the infected brains, block the production of toxic proteins, and halt degeneration in the brain. “The findings of this study offer evidence that P. gingivalis and gingipains in the brain play a central role in the pathogenesis [development] of AD [Alzheimer’s disease], providing a new conceptual framework for disease treatment,” the study authors write. This is not the first study to show a relationship between gum disease and Alzheimer’s. A 2017 study out of Taiwan found that people with chronic gum disease lasting 10 years had a 70 percent increased risk for developing Alzheimer’s. Another small study published in 2016 in the journal PLOS ONE found gum disease was associated with a six-fold increase in the rate of cognitive decline in people with mild to moderate dementia. Other research has looked at whether various bacterial, viral, or fungal infections may play a role in Alzheimer’s, but there is currently not enough evidence to say. In other words, it’s unknown whether gum disease increases the risk of Alzheimer’s or if people with dementia have an increased risk of gum disease because of poor oral care. Edelmayer also cautions not to put too much weight on drugs tested in mice. “It really will be important to see how this plays out in human randomized controlled trials, which is the gold standard for understanding whether a therapeutic targeting something like the P. gingivalis mechanism would actually be effective,” she said. Could good oral care help prevent Alzheimer’s? While taking care of your teeth and gums is an important part of healthy aging, Edelmayer says it’s too early to say if those steps could help prevent Alzheimer’s disease. Of course, there are many factors that go into someone’s individual risk of developing dementia. The Alzheimer’s Association has a campaign called “10 Ways to Love Your Brain” to help people lower their risk. “We think a lot about things like diet, exercise, a good management of cardiovascular health, getting good sleep. All of these things could potentially play a role as a lifestyle intervention for decreasing your risk of developing cognitive decline,” Edelmayer said. She notes that good oral health could one day fall into one of these categories if there’s more evidence to show that gum disease actually increases the risk for developing dementia. Still, Edelmayer says with so much still unknown about the disease, studies like this are important for gaining a better understanding of Alzheimer’s. Your teeth age with you. It’s important to keep them strong and healthy even as you grow older. Seniors are at a higher risk for developing periodontal disease. In addition to getting a regular dental examination, here are some other tips to keep your teeth healthy. Regardless of age, we cannot stress the importance of keeping up with a daily oral hygiene routine. Make sure you are brushing twice-daily and flossing at least once per day. For seniors with dentures, it is important that you remove them for at least four hours each day. We recommend removing them at night. Dentures need to be cleaned daily so make it part of your routine as well. We also suggest staying hydrated by drinking water. Not only does water help keep you producing enamel building saliva, but if it contains fluoride, it can help keep your teeth strong. Make a regular visit to our office part of your routine as well. If you are the primary caregiver of someone elderly, working with them to keep their teeth healthy can be a challenge. It is up to you to remind them to brush and floss regularly. 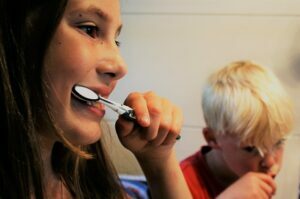 Help them by establishing a routine and set times for brushing their teeth. We ask that you assist them in making an appointment to visit our dental office. If keeping up with daily dental health seems to be too difficult, please contact our office. We can work with you to offer some advice and solutions. For seniors in a nursing home that are enrolled in state or national financial programs, the American Dental Association (ADA) suggests considering the Incurred Medical Expense regulation. This works to assist in paying for care that is deemed a necessity. If our dentist finds that treatment must be done, consider this as an option to lessen the financial burden. Talk to your nursing home or care facility’s caseworker for more information. Periodontal disease, or gum disease, can be brought on by certain medications. When you visit our office, be sure to update us on any changes to your medications. At times, early periodontal disease is painless which makes it even more important that you keep a regular routine of visiting our office for a thorough exam and evaluation. According to the ADA, more than 47% of adults over the age of 30 have chronic periodontitis. Keeping your teeth healthy as you age can be difficult. We suggest sticking to a daily routine in terms of brushing and flossing, and keeping up with regular visits to our office. 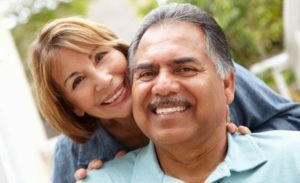 If you are the caregiver of an elderly spouse, parent, or loved one, do not overlook their oral health. Make sure they are receiving the needed attention and are sticking to a daily oral healthy routine. For more tips on keeping your teeth health or to set up your next appointment, please contact our office. 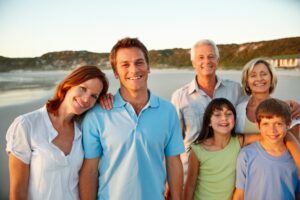 Raleigh Periodontist | What is Periodontal Disease? Periodontal disease ranges from a mild inflammation of the gum tissues to periodontitis, a major oral disease that can result in soft tissue and bone damage. Periodontitis is the leading cause of adult tooth loss in the United States. One of the major causes of gum disease is practicing poor oral hygiene habits. Daily brushing and flossing and regular professional exams and cleanings are essential to maintaining optimal oral health. When these practices are not followed, plaque can form on the teeth and along the gumline. If this plaque is not properly removed, it may harden over time and become tartar. Once that occurs, only a dental professional can remove the tartar from teeth. If gum disease is not treated in a timely manner, tartar may continue to build unchecked. When this occurs, the gum disease may advance to gingivitis. In this stage, gums redden, swell, and become prone to bleeding from normal activities, such as brushing or eating. Some other common symptoms include: chronic halitosis (bad breath), sensitive teeth, and difficulty or pain with chewing. At this point, professional periodontal treatment is needed to prevent the gingivitis from advancing to periodontitis. When gingivitis is not treated in time, it may become periodontitis. Periodontitis is the most advanced form of periodontal disease. With periodontitis, gums begin to pull away from the teeth, creating small “pockets” along the gumline. These spaces are highly difficult to clean without professional intervention and can lead to rapid worsening in overall oral health. Without prompt and thorough treatment, bone, gums, and soft tissues may be destroyed by periodontitis. Some of the most common factors that contribute to periodontal disease developing include poor oral hygiene habits, diabetes, smoking, and hormonal changes in women. Some medications can cause gum tissue to grow abnormally, which can increase difficulty in proper cleaning of the teeth. People who are receiving treatment for AIDS are also at increased risk of developing periodontal disease. Many recent studies have found that untreated periodontal disease may negatively impact other aspects of your overall health, especially for patients with cardiovascular disease or diabetes. Periodontal disease can also increase the risk of developing certain pregnancy complications, such as low birth weight or premature birth. Our doctors have the training and experience to diagnose and treat every stage of periodontal disease. If you have symptoms of periodontal disease, contact our office to schedule a consultation.